Get ready for a delightful adventure with this week’s meal plan recipes that are sure to please your taste buds! As the excitement of the holidays is well underway, we are happy to enchant you with the familiar and the novel. We start the week with a Teriyaki Chicken Bowl that will warm you from the inside out. We then move into a bit of creativity with our Indian-inspired chili that will make you wonder why you never paired these flavors together before now. On Wednesday we bring back our Miso-Maple Crusted Chicken Breasts (a community favorite!) and then end the week with a weeknight-friendly take on Moussaka – a ground lamb and eggplant dish from the Eastern Mediterranean, Middle East, and Balkans. Take your dinner table on a little journey with us before the hustle and bustle of the holiday season officially sets in. We even have meal prep tips, cooking tutorials, and suggestions for leftovers below so you can save as much time as possible while still getting a delicious meal on the table. Click here to try this week’s menu! Kale keeps popping up on more and more restaurant menus, but if you’ve never made it at home before, we know it might seem intimidating. That’s why we have this short video to teach you the basics of prepping kale for Monday’s Sesame Edamame and Kale Salad. (Remember – all of our meal plan menus include video tutorial links in every recipe!) To tenderize and soften your kale, try massaging leaves with the dressing before serving. In Tuesday’s chili recipe, we use an Indian spice blend called garam masala. It’s slightly sweet and spicy and has an overall warm, earthy mix that typically includes the following spices: cloves, cinnamon, cardamom, mace or nutmeg, cumin, coriander, bay leaf, and pepper. This tasty ingredient is a superb addition to any pantry and can be found in the spice aisle of your local grocery store. To close out the week, we top our deconstructed moussaka with a creamy layer of béchamel (a white sauce made with milk and thickened with flour). The key to a smooth bechamel is whisking constantly as you cook it. Heating the milk slightly before adding it to your sauce also helps to prevent lumps from forming. This week we use fresh ginger to add a zesty punch of flavor to both our homemade teriyaki sauce and Indian Chili. To ensure that your bundle of green onions don’t go bad, we help you use every last stalk in 3 of our 4 meals this week. To be extra efficient in the kitchen this week, make a double batch of brown rice on Monday and then heat up the remaining half for Wednesday’s dinner. Since it’s not every day you make lamb, we’re sure you want to put any leftovers to good use! Pair any extra with leftover béchamel sauce and whatever leftover veggies you have in the fridge, and top over egg noodles for a fun pasta dish. One of the best ways to enjoy fried rice is to make it healthy, yet delicious. For a quick lunch this week, combine leftover sesame kale, carrots, edamame, and chopped chicken (or tofu, if you opt for our veg version!) for a fantastically nutritious fried rice. Smart meal planning ideas come with every weekly menu. The smarts listed above are only a portion of the tips we include to help you make the most of your ingredients and your time. Join our community to get the full benefits of our meal plan service every day! Teriyaki sauce is the perfect combination of sweet and savory and is especially delicious when made fresh. This week you can use it to take a chicken rice bowl to the next level. Served with a side of edamame and sesame kale, this healthy meal is packed with protein, whole grains, and dark leafy greens. It will nourish your body and delight your taste buds! Those wanting a meat-free meal can enjoy a teriyaki tofu recipe while anyone on a gluten-free diet can simply substitute soy sauce with Tamari. Our Paleo teriyaki chicken recipe uses cauliflower rice and a Paleo-friendly teriyaki sauce to go with sesame kale and carrot salad. For a creative twist, we use a mix of Indian spices to bring mouthwatering flavor to turkey, bean, and sweet potato chili! Served with crispy naan chips and a dollop of yogurt, this meal will shoot straight to the top of your “make again” list. Whether you choose to make it with a slow cooker, Instant Pot, or on the stove top, you’ll love just how easy this cozy meal is. Instead of turkey, our vegetarian chili recipe uses cubes of protein-rich paneer, a cheese common in Indian cuisine. Meanwhile, making this exquisite meal gluten-free only requires swapping naan chips for tortilla chips. Our Paleo chili recipe nixes the yogurt and beans, adds peppers to the chili, and makes spiced baked sweet potatoes on the side. Miso-maple butter is something everyone should try. Why? Because it is great on everything! 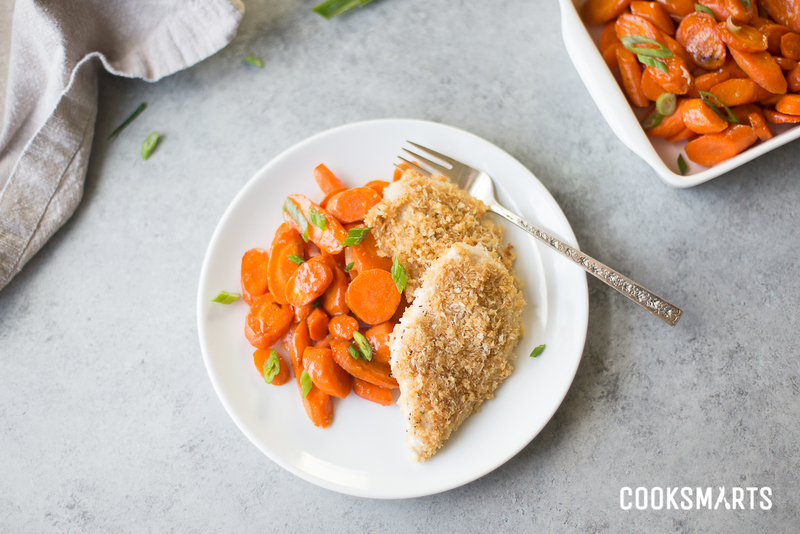 Since our community can never get enough of its delectable flavor, we use it on both the roasted carrots and crisp panko-crusted chicken breast. This quick dinner is ready in a mere 40 minutes but after one bite you’ll feel like you were just transported to a fancy restaurant. Our vegetarian recipe fills portobello mushrooms with miso-maple butter and panko and serves them with roasted vegetables and chickpeas over brown rice. Those eating gluten-free can simply use GF breadcrumbs and anyone on the Paleo diet can enjoy our Aminos-Maple Almond Crusted Chicken Breast recipe. Our deconstructed moussaka captures all the flavors of this beloved Greek dish, but actually makes it possible to cook in the middle of the week. While most recipes take over 2 hours, our easy moussaka can be on your dinner table in just 50 minutes! So, this week, treat yourself to ground lamb, onions, eggplant, and russet potatoes topped with a creamy béchamel sauce. Our vegetarian moussaka replaces the lamb with protein-packed lentils while our gluten-free version swaps out everyday flour for any GF flour blend. For those following a Paleo diet, this recipe version uses parsnips instead of potatoes and still achieves a creamy sauce by using almond milk as a base.